If you caught our laundry room reveal this week, you might have realized something is missing... where's the pantry I've been talking about that goes along with knocking out all those walls?! Today, you get a little sneak peek! 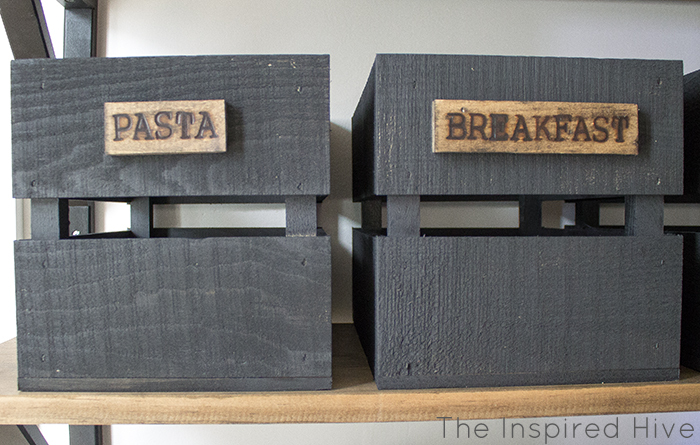 The pantry is just about done too, but I have a couple of projects I want to share with you first! 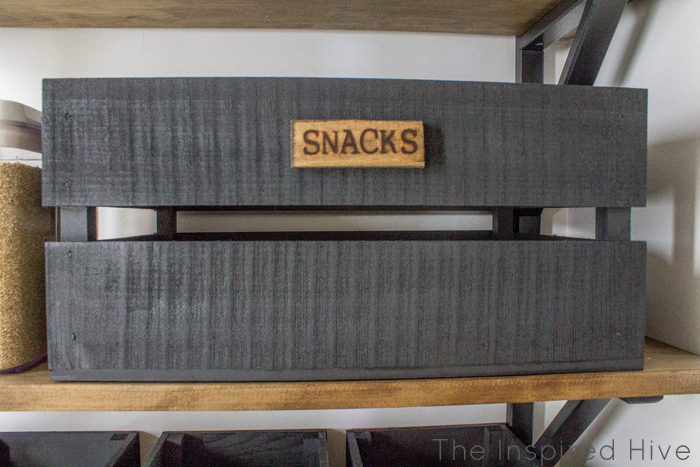 Today, I'm sharing our new DIY pantry organization! 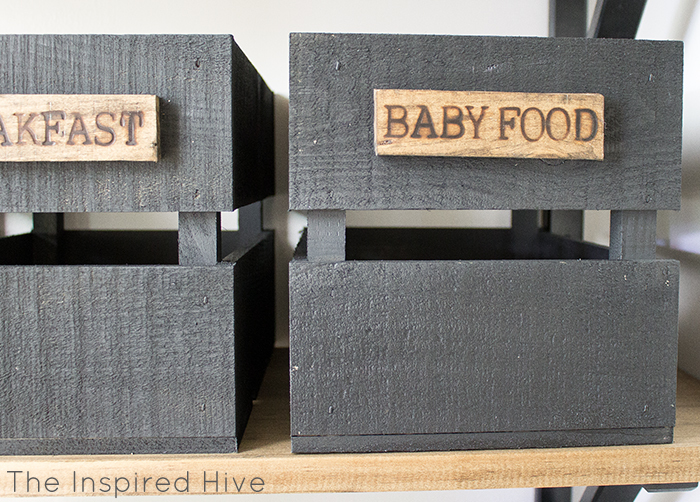 I'm so happy with how our rustic wooden storage crates turned out! The lovely folks at Walnut Hollow provided product for this post.As usual, all opinions are my own, and I only share products with you that I loveand think you will love too! This post also contains affiliate links for your convenience. Please see my full disclosure policy. Since the new pantry flows into our new rustic-industrial laundry room, I wanted the pantry to have a similar rustic feel. I also wanted it to be very organized because living out of a couple of small kitchen cabinets for three years has made cooking a frustrating experience! I wanted a specific place to put everything so there would be no more digging around for what I need. Wooden crates fit my vision perfectly! 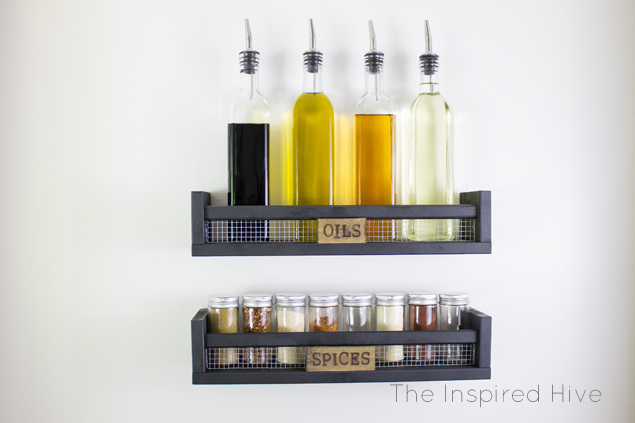 They are versatile enough to look rustic and can be easily organized with some labels. I decided that wood tones and black paint would help pull the look together to blend in with the laundry room. Then, it dawned on me that wood-burned labels could be the perfect rustic touch and could look really cool! 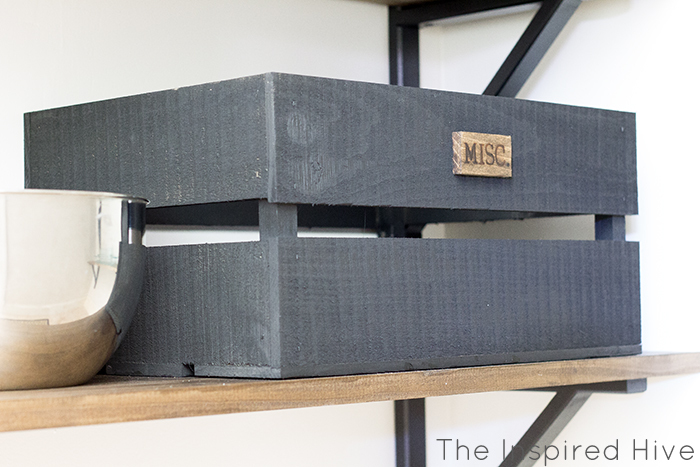 I had only done a few wood burning projects in the past, but it was easy enough that I thought it could work for the crates... and I seriously couldn't be more thrilled with how it all turned out!!! 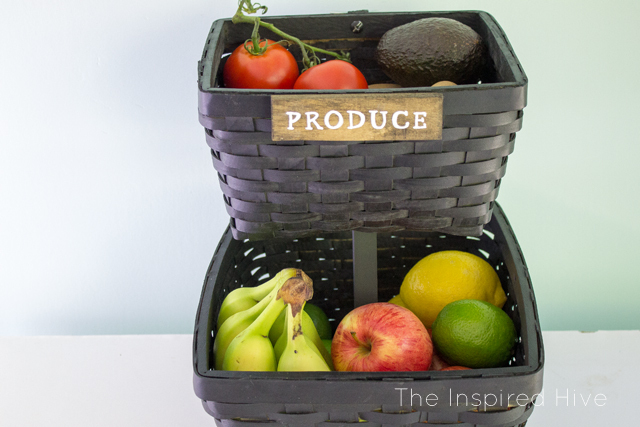 It was so easy to do and is the perfect organizing idea! If you haven't tried wood burning yet, you need to! I painted them with a flat black paint. I actually started out with a can of paint and a paint brush, but after finishing one crate, I realized it was going to take wayyyyy too long to get into all of the nooks and crannies with a brush! I'm all about quick and easy! So, back to the store I went! 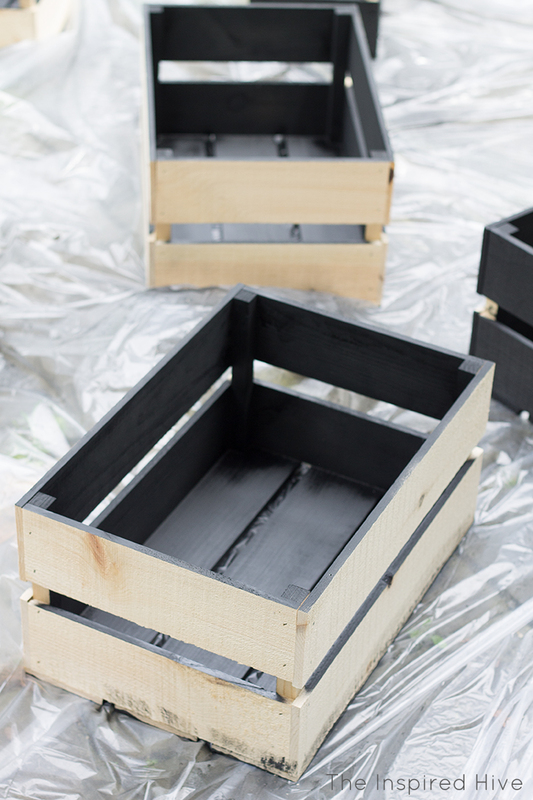 It took three cans of Rustoleum's flat black 2x spray paint and about an hour to cover all 8 crates. I let them dry thoroughly and then went back and touched up a few areas, but for the most part it was easy to get good coverage with one coat of spray paint! 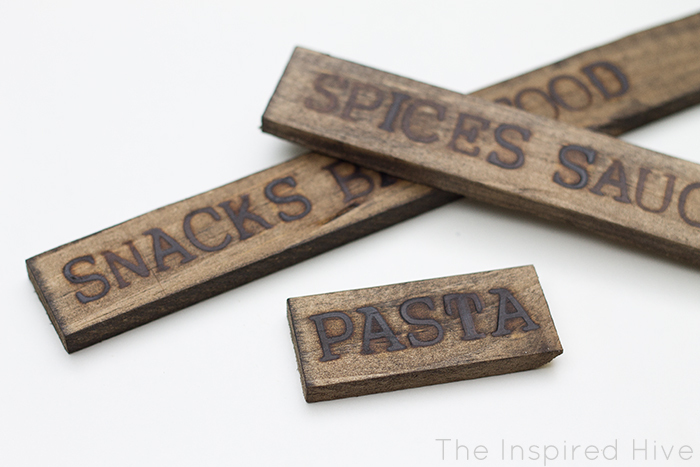 For the wood burned labels, I used Walnut Hollow's small wooden slats. Using a utility knife, my husband and I cut them lengthwise. 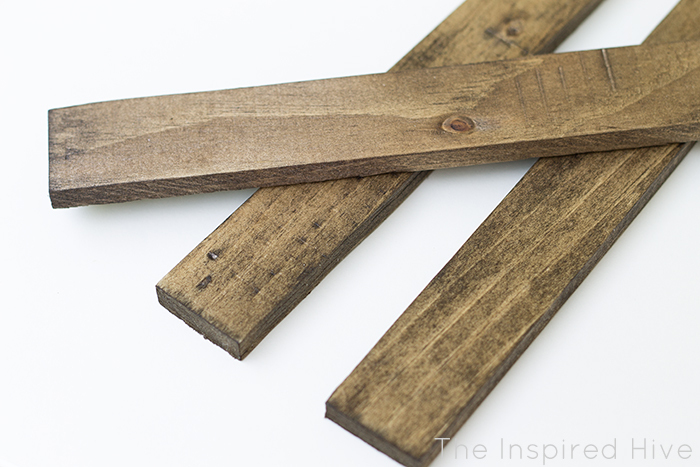 The slats are made with soft wood, so they are fairly easy to cut. After cutting, I smoothed the cut edges with 120-grit sandpaper and gave them all a coat of my absolute favorite wood stain. Be sure to allow the stain to dry completely before using the wood burning tool. We don't want any fires! 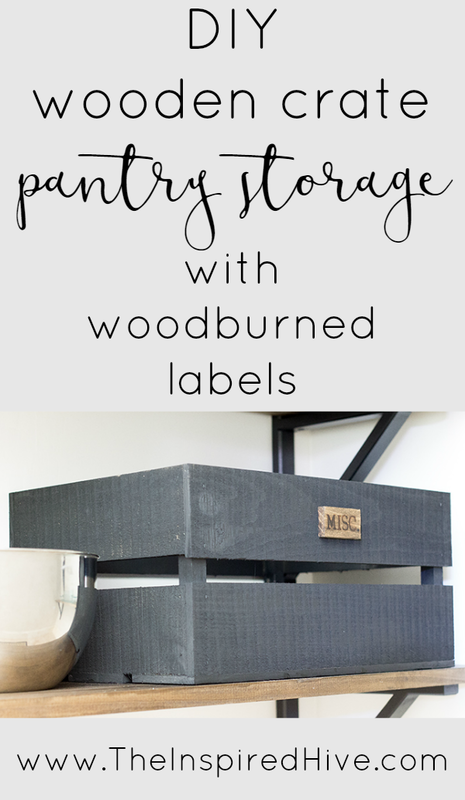 Next, I wrote out a list of label names to keep the pantry organized and got my HotStamps letters ready. Then I burned the label names onto my stained wood slats. The HotStamps letters make it so easy! They screwed right into my wood burning tool and work with any of Walnut Hollow's other wood burning tools. 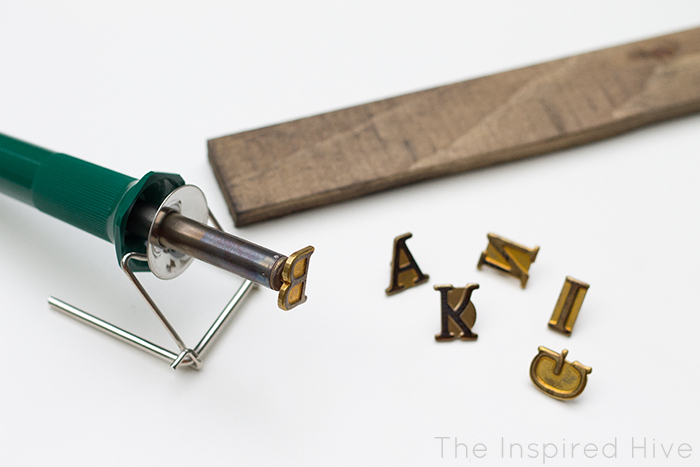 I used a scrap piece of wood to test how long to hold the letters against the wood once hot. I found that 15-20 seconds seemed to work best for me. To change out the letters each time, I turned off the wood burning tool, used my multi-tool to remove the hot letter and screw the next letter in, and quickly turned the wood burning tool back on. This process helped me move through each word fairly quickly and kept me from getting burned. I definitely suggest using pliers or a multi-tool for removing the letters! After burning all of the words onto the slats, we used the utility knife to cut between each word, sanded the cut edge, and touched up the stain on that side with an old cloth. I found it easier to cut them after burning rather than trying to estimate how long each word would be in order to cut ahead of time. And here they are! I can't get over how perfectly they fulfilled the vision in my head!!! And as tough as the whole laundry/pantry build has been, this was the easiest and most fun part! These are so stinkin' cute, Nicole! How cool is that wood burning tool?! I can't wait to see the rest of the space! This is the cutest look! Love this idea! What a great idea! 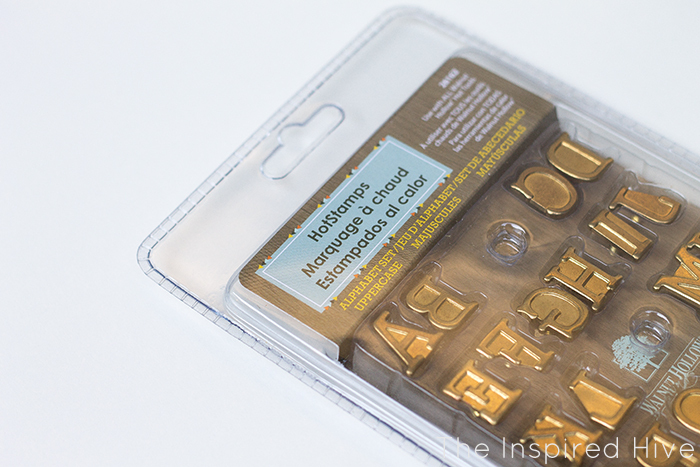 SUCH a pretty take on labelling!